The World Health Assembly approved a resolution on the General Programme of Work on 21 May 2013. It gives a high-level strategic vision for the work of WHO through 2019, and explains how the Organization will contribute to the achievement of health outcomes around the world. The Health Assembly also agreed to changes to the financial regulations and rules, so that Member States approve the entire WHO budget, financed from both assessed and voluntary contributions. This is a vital part of WHO’s financial reform. 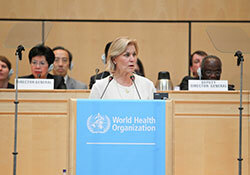 The Sixty-sixth World Health Assembly is taking place in Geneva, Switzerland on 20–28 May 2013. Addressing the Health Assembly, Ms Gunilla Carlsson, Minister of International Development Cooperation, Sweden, noted that the number of years people live in good health is not keeping pace with increases in life expectancy. She presented her vision of good health throughout the life-course, encompassing lower child mortality, immunization in childhood, healthy behaviour with access to health care in adolescence and adulthood, and a healthy old age. The Minister concluded by expressing her full support for the WHO reform process to modernize the Organization and make it more effective. Delegations of several European countries suggested priorities for the development agenda after 2015, the deadline for the Millennium Development Goals. Belgium emphasized that it is unacceptable for some families to fall into poverty because they cannot afford to pay for health care, and called for universal health coverage to be a priority. The Icelandic delegation identified ageing, noncommunicable diseases, the health impact of climate change, and emergency preparedness as focus areas, and Malta called for future goals to be rights based, and for health to be a cross-cutting objective. The delegation of Poland called for the inclusion of such issues as the rise in noncommunicable diseases, access to primary health care and improving cross-sectoral collaboration. The delegation of Portugal identified achieving higher standards of clinical care, focusing on antimicrobial resistance and working to give patients choice as national priorities in a plenary intervention. In plenary debate, the Ukrainian delegation highlighted the country’s work to modernize its health system and progress in maternal and child health, HIV/AIDS and tuberculosis, and offered to share Ukraine’s experiences with other countries. Referring to cases of Middle East respiratory syndrome coronavirus, the delegation of France noted that health security is a critical international issue, and implementing the International Health Regulations must be a priority, with WHO’s role including planning for tomorrow’s challenges as well as dealing with health emergencies. In a plenary intervention, the delegation of Kazakhstan spoke of implementing Health 2020, and the country’s progress in reducing infant mortality and increasing life expectancy by focusing on preventive primary health care, introducing new health payment mechanisms and improving the quality of care. Kazakhstan will hold a conference in November to mark the thirty-fifth anniversary of the adoption of the Declaration of Alma-Ata. The delegation also discussed plans for the anniversary conference at a bilateral meeting with Ms Zsuzsanna Jakab, WHO Regional Director for Europe. The delegation of Georgia explained the country’s health priorities – including universal health coverage, quality of care and patient safety – in an intervention. The delegation of Israel expressed its support for universal health coverage in a plenary intervention. A side event organized by Sweden and the United Kingdom focused on the global threat of antibiotic resistance, underlining problems that may mean that some diseases will soon become untreatable: misuse of antibiotics, slow research and development with limited investment, and the lack of new antibiotics in the pipeline. WHO’s strategy, with WHO/Europe involvement, covers three areas: raising awareness and stakeholder engagement, building national capacity and innovation, research and development. Sustainable reform of the health system was the main focus of a bilateral meeting between the WHO Regional Director for Europe, and Dr Petros Petrides, Minister of Health of Cyprus. The Regional Director offered technical support to develop a policy dialogue with national stakeholders and provide policy recommendations based on evidence on the impact of the economic crisis on health. Discussions with the Minister of Health of Poland, Mr Bartosz Arłukowicz, addressed the importance of adopting the revised European Union (EU) directive on tobacco products and intersectoral work to find alternative income sources for tobacco-producing countries. Promoting healthy eating through dialogue with the food industry and appropriate food labelling was also discussed. At a meeting with the Minister of Health of Malta, Dr Godfrey Farrugia, the Regional Director thanked Malta for hosting the 2012 session of the WHO Regional Committee for Europe, and noted the country’s positive health indicators. The Minister requested WHO support in initiating a policy dialogue on health-system financing. The Regional Director thanked Mrs Laurette Onkelinx, health minister of Belgium, for the country’s support in addressing antimicrobial resistance, and to the WHO offices in the country. Belgium’s social security system and focus on social protection were discussed as good examples of ways to protect health during economic crises. Dr Mehmet Müezzinoğlu, Minister of Health of Turkey, met the Regional Director to discuss plans for the 2013 session of the WHO Regional Committee for Europe, to be held in Izmir, Turkey in September. He thanked the Regional Director for highlighting Turkey’s public health achievements, and explained that universal health coverage, maternal and child health would continue to be priorities. The Minister also noted that Turkey had achieved much in tobacco control, and would do further work to address health issues related to alcohol, nutrition, obesity and physical activity.